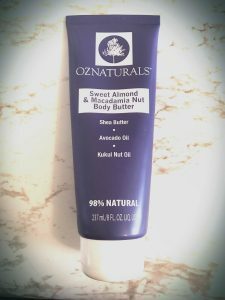 I received the OzNaturals vegan skincare products mentioned in this post in exchange for my honest review. Thank you for supporting The Wise Willow! As you may have gathered by now, I am quite obsessed with natural skincare products, and when I became vegan I found that it was even harder to find skincare products that traveled well and made a noticeable difference in the health of my skin (I have always had combination skin that definitely acts up when I travel or make other lifestyle adjustments). Lately I have been making a fair few lifestyle adjustments, and in the process I have tried to maintain my skin as much as possible. This can definitely be challenging with changing temperatures and sleeping patterns! 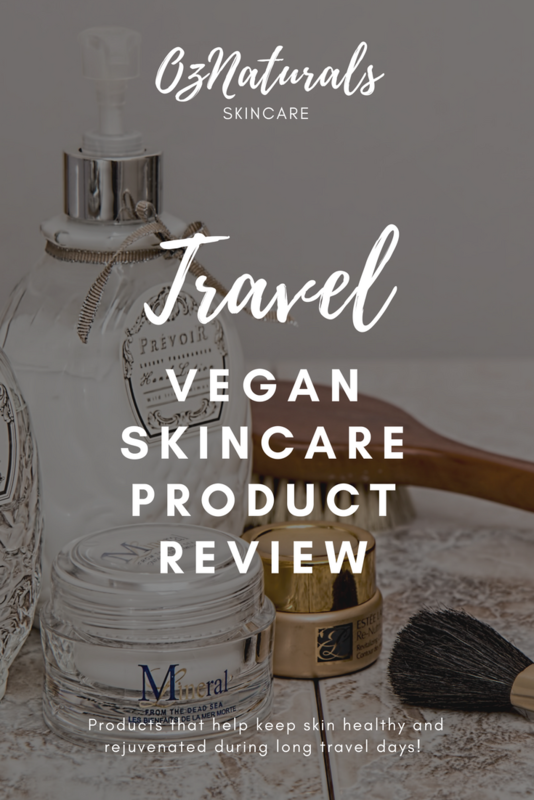 I was looking for products that would allow me to establish a routine, as well as ones that I could use on the go during long travel days. OzNaturals kindly sent me a few of their summer skincare products, and wow have they made a difference in how my skin feels on a daily basis! Just this week I have had a few long travel days, with inner city exploring in between! In fact, I leave on another plane in a matter of hours. When I travel my skin alternates between being quite dry (usually from the airplane journey) to feeling oily from hours of nonstop travel. After long journeys I also notice tightness around my eyes, which makes me feel even more tired than I actually am (this would also happen to me from late nights of reading during the semester). I took these products with me when I began my journey, and I wanted to share how they have helped me stay healthy and feeling refreshed despite long travel hours! 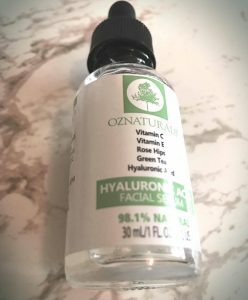 This facial serum contains Vitamin C (something I have always looked for in skincare products, because it is quite refreshing! ), Vitamin E (which has amazing restorative properties! ), Rose Hips, Green Tea (caffeine is also good for the skin), and Hyaluronic acid. This has been wonderful in keeping my skin even, and eliminating the excess oil that tends to accumulate after being in changing temperatures and modes of transport. The best part, though, is that it doesn’t excessively dry out my skin! This is something that many of the serums I have used in the past do. Also, it is a vegan product with no animal testing or animal derived ingredients. (Curious about the difference between cruelty-free and vegan products? Cruelty free essentially means that no animal testing was used to make the product, while vegan means this and that no animal derived ingredients are used. A product can be cruelty-free and not vegan, for example (as it might contain something like carmine, which is a derivative of an insect that is commonly found in lipsticks and other cosmetics with bright red colors). As I mentioned before, my eyes are definitely affected by long travel days and long days of studying. The tightness does not help with already feeling quite fatigued. This eye gel is the best for feeling refreshed after a long flight without a lot of effort! I have also found that it has aided with getting over jetlag, or generally feeling more exhausted than usual. The tightness and dryness of my eyes has been reduced, and I have found that I am also less sensitive to wind and other elements that would sometimes give me allergy-like symptoms. This eye gel contains Matrixyl Synthe 6, Plant Stem Cells, Peptide Complex, Hyaluronic acid, and Vitamin E. It is both effective and soothing, and definitely worth it if you find that you have tired eyes from different routines or travel! This might be the favorite product for me out of the bunch, but that’s because I absolutely love lotions (especially ones that smell as good as this one does!). Sometimes I neglect to take care of my skin in general during busy times, and this is a great addition to my nighttime routine that allows me to unwind after a long day. The best part about this lotion (besides it being vegan of course, which is hard to find!) is that a little goes a long way. Some lotions take a few applications to work well, but this lotion includes both a generous amount of product and an amount that will last through many trips. It contains Shea Butter, Avocado Oil, and Kakui Nut Oil for a perfect balance that isn’t too heavy nor too light (another combo that is hard to find!). I am about to start my semester abroad, and I am so glad that I will be able to continue my skincare routine no matter where I am! 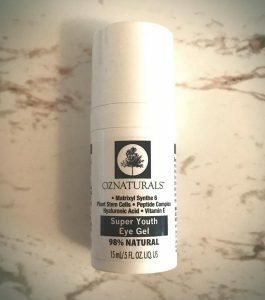 If you would like to find out more about OzNaturals and their mission, you can look here for more information! I am also writing a post full of self-care travel tips, which will be posted in the near future!